The playoff-bound Blue Jays made a last-minute deal to ensure they would field their best team possible in the post-season. The team was already good, but Pat Gillick made a last-minute deal to ensure it would be even better. 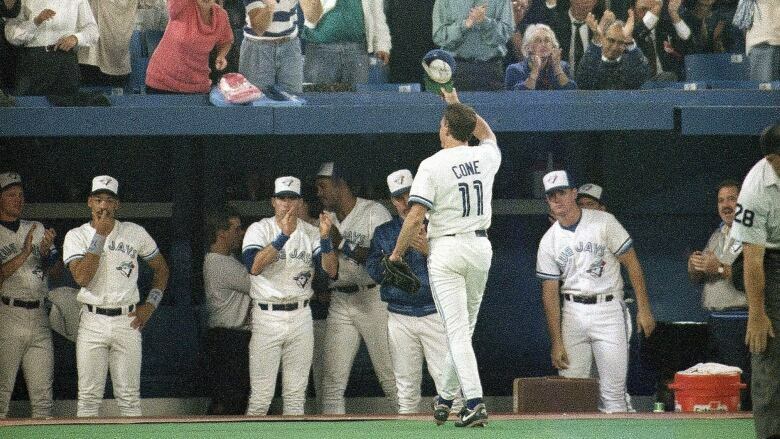 The longtime Blue Jays general manager traded for pitcher David Cone in final days of the 1992 regular season. Cone was the ace on a struggling New York Mets team that was en route to a 90-loss season. He was also the leading strikeout pitcher in his league. But he'd been put on waivers, so the Mets could send him to another team. On August 27 of that year, he became a Blue Jay just in time to be part of the team's first World Series run. The deal to bring him to Toronto, however, would cost the team a future MVP from their own ranks. After learning he was headed to Toronto, Cone said he was pleased to be headed to a team that would still be playing baseball in October — and in a city he might be willing to stick around in. "I think the Blue Jays are an exciting team and I'm really excited about being in a pennant run," he said. Manager Cito Gaston called Cone "a gamer" who wanted to win. "I think he's going to fit in real well," Gaston said, knowing the hired gun would be joining a pitcher rotation that already included Jimmy Key, Juan Guzman, Jack Morris and Todd Stottlemyre. Cone won four games for the Jays in the final six weeks of the regular season. And then he helped the Jays win the American League pennant and the World Series — the first of two back-to-back championships for Toronto. The pitcher did not re-sign with the team in the off-season, however. That meant the two players sent to the Mets — Jeff Kent and Ryan Thompson — were the cost of doing business for the Jays during their playoff run. Thompson, an outfielder, would spend four seasons with the Mets and play baseball through the 2002 season. Kent, a rookie infielder, was a bigger long-term loss for the Jays, however. "He's got a chance to be a good, good, solid player," said Gillick, about Kent's prospects when heading to the Mets. Solid, indeed: Kent had a huge MLB career after leaving the Jays, winning four Silver Slugger awards, an MVP award in 2000 and being named as an all-star on five occasions. But as CBC pointed out in its coverage of the Cone deal, Kent's path to the Toronto infield was blocked by Roberto Alomar and Kelly Gruber, then two mainstays of the Blue Jays lineup.